We don’t like talking too much about cycling crashes, but we do believe the data should be used to help inform where infrastructure spending ought to be directed for maximum benefit. There is an obvious black spot on Dornoch Tce at Highgate Hill, due to its popularity on “the River Loop” and the severity of injuries to cyclists who have crashed on this steep hill. Aside from this, there is another glaring black spot for cycle crashes in the CBD – particularly concentrated along Adelaide St.
Annerley Rd is another well known hotspot, which will at least be partially addressed with the Woollongabba Bikeway. South Bank at the intersection of Grey and Melbourne Streets. 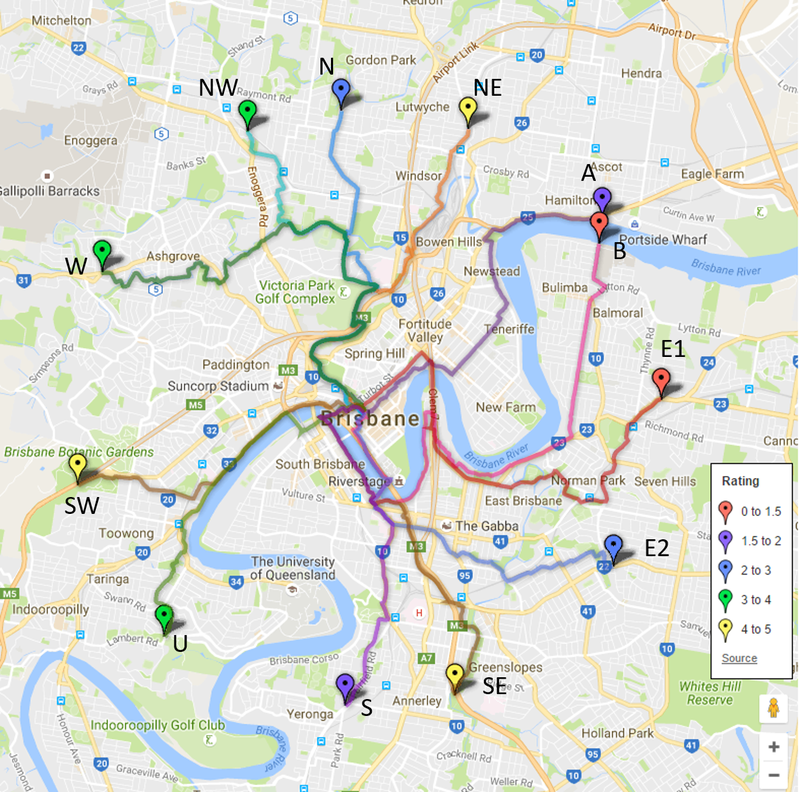 These are all locations where the BUGs have been asking Council (or as relevant TMR) to provide improved infrastructure, or high quality alternative routes. The map clearly shows where investment in cycling safety needs to occur. The good news is that the overall crash numbers and crash costs have fallen slightly in the last two years – which could possibly be due to laws and education around minimum safe passing distances. Looking at the days and times crashes occur, this isn’t just something that’s happening to weekend warriors; weekday crash rates are highest, and people travelling at peak times make up the majority of those getting hurt. *Crash risk cost assessments apply a low cost to crashes resulting in only minor injuries; a higher cost to those requiring medical treatment; significantly more for those requiring hospitalisation; and a high premium on fatalities.